Join the discussion on our forums! Come discuss Hecklebot over in our dedicated Hecklebot discussion topic. Taunt Battlecry: Your opponent summons a minion from their deck. Built by goblins, designed by a troll. I´m curious why this does´nt see more play. I play two of these in my control shaman and it´s just insane. if you play this early on vs aggro it´s gg. It´s also very good against warrior to pull out boom, alyssiana or any bomb minion. And it lines up great with zilliax. Only bad matchup is probably mage. I think he's very good to mess up opponent's strategy. If you play a control deck, you want to play this minion as early as possible, on turn 4. It’s not Dirty Rat, which you holded until your opponent drew all the cards. 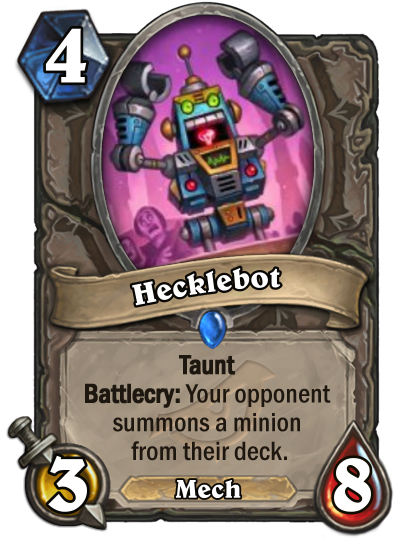 This card summon a random minion directly from the deck right? Like "Your opponent Recruit a minion." ? Blizz is intentionally keeping some keywords expansion specific, and explicitly wording them otherwise. This is to keep standard card pool clean of "odd" keywords appearing on singular cards. They even removed Enrage keyword because it was too niche.